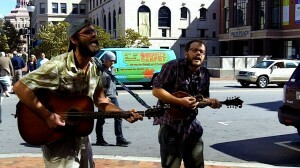 A few days ago, I featured these two performers in a post about my occasional epic fails in recording street musicians. 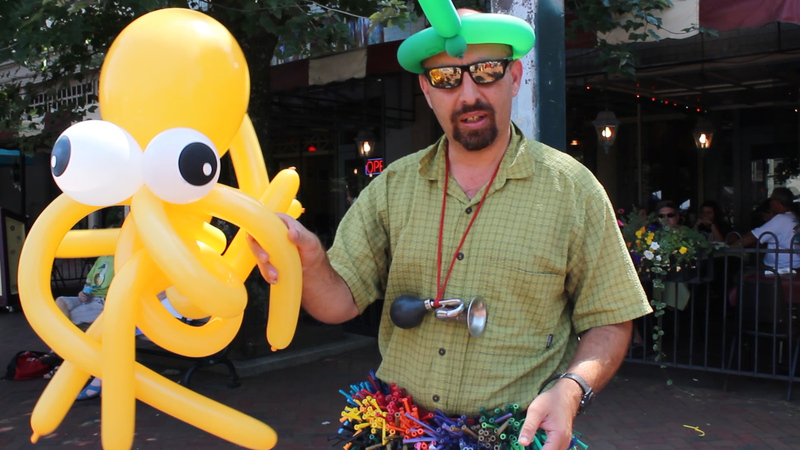 Normally, I make a point of getting at least a reasonable amount of information from the buskers I record, as showcasing them is really the only point of the project in the first place. Not having something as fundamental as the performers names really chewed on me, as that’s not a mistake I generally make. The Leather Britches: Nick DiSebastian (guitar), Bronwyn Keith-Hynes (fiddle), Jen Starsinic (fiddle) and Charles Muench (bass). Listening to how neatly the members of The Leather Britches fit together as performers, you’d be hard-pressed to guess that the group had only been playing together under that name for the better part of an afternoon. 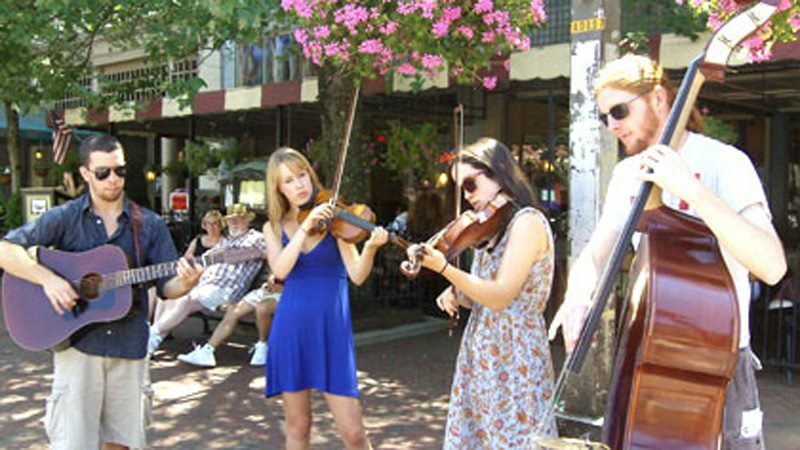 Composed of four friends who came to Asheville for, as they sheepishly put it, “this fiddle gathering … like a convention.” Of course, anyone who follows the Asheville music community would instantly know what they were talking about: The Swannanoa Gathering at Warren Wilson College. 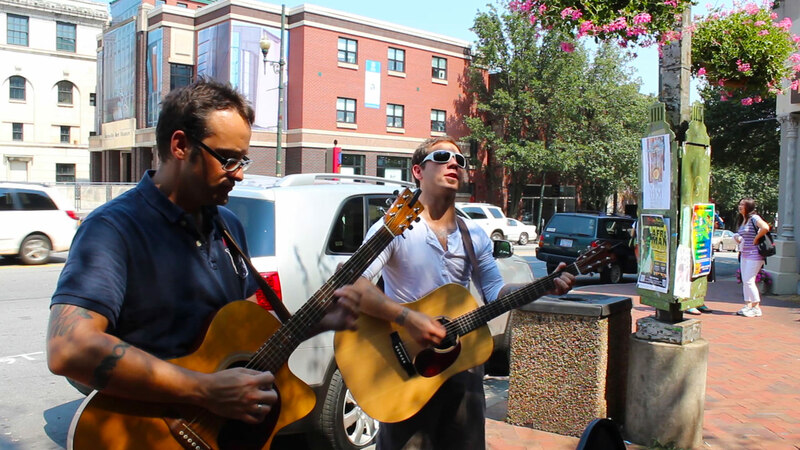 The quartet wouldn’t exactly characterize themselves as a band, although Nick DiSebastian (guitar) and Charles Muench (bass) were both members of the Lancaster, PA, group River Wheel. 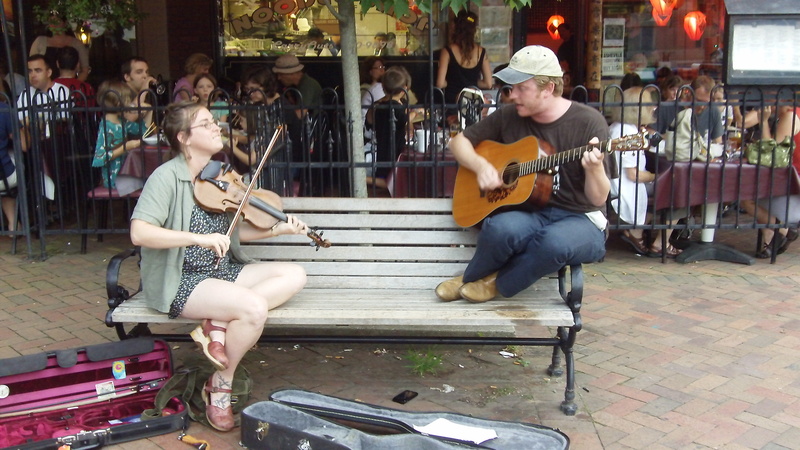 Bronwyn Keith-Hynes (fiddle) and Jen Starsinic (fiddle) also had a musical project together, and three of the four lived in the same town and attended the same school, and had played together under various names over the years. On this day, they had decided to call themselves The Leather Britches. 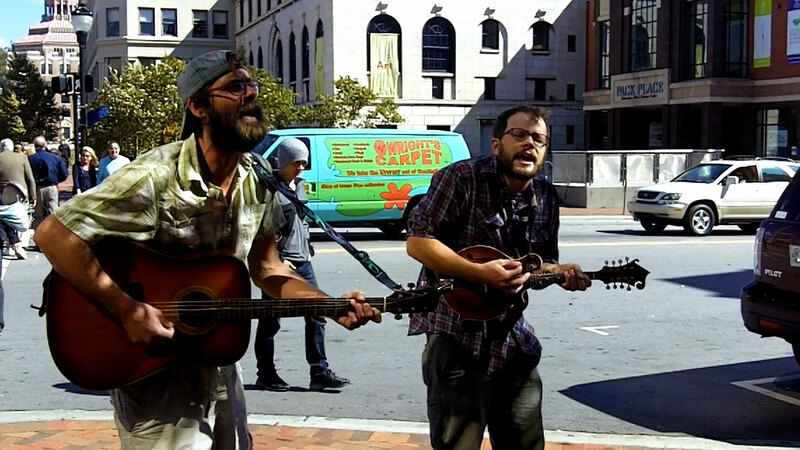 Bluegrass-loving buskers Chris Lyon and Adam Witkowski performed a pair of original tunes for this 2011 session of Busk Break. 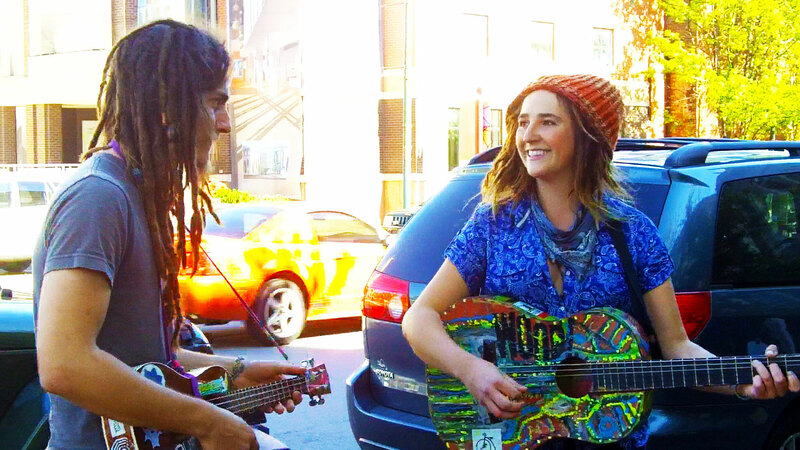 Switching between mandolin and guitar, the duo each played one of their own songs with the practiced ease of friends who have been working with each other for years. 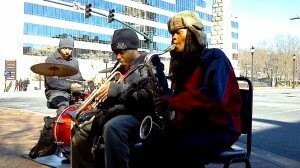 The Slaughter Brothers Band perform at Pack Square. 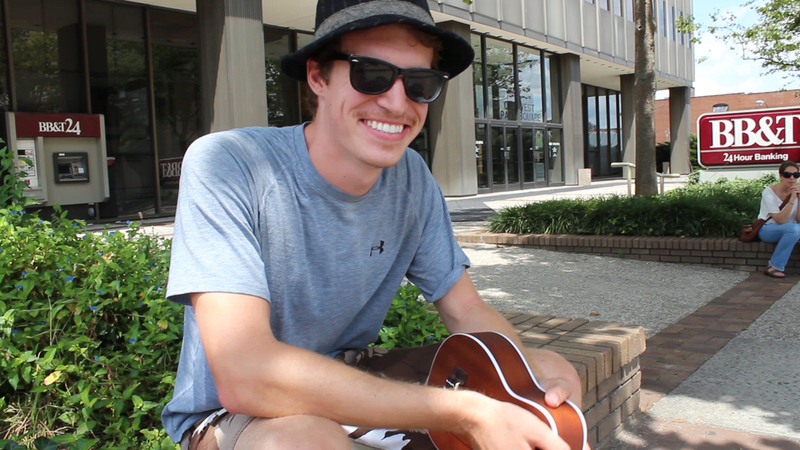 Jackson Porter in front of the BB&T building in downtown Asheville. Sitting alone in front of the BB&T Building near Pack Square, his large backpack casually flopped to one side, Jackson Porter was quietly playing to himself when I met him. He wasn’t exactly busking, as he didn’t have a hat out or anything, but he wasn’t no-busking either. He told me he was taking some time off from school, and had been backpacking and hiking around, doing sections of the Appalachian Trail among other adventures. He’d only been playing the ukulele for a short time, but found that his guitar experience transferred pretty well. Sean Mabe, Wendi Loomis and Mario Piccolo playing as The Gypsy Swingers. 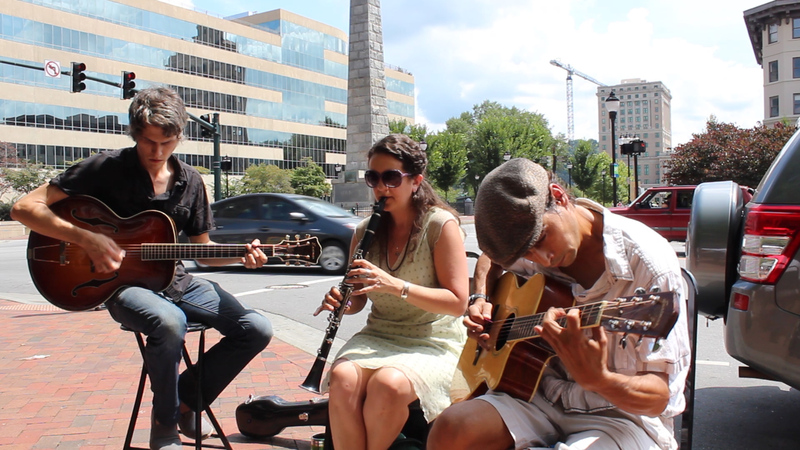 In most other cities, you’d never see musicians like clarinet player Wendi Loomis and guitarists Mario Piccolo and Sean Mabe busking for tips. You’d only see them performing in night clubs and upscale bars as the evening’s featured entertainment. And, as the Gypsy Swingers (or, in a slightly different arrangement as the Red Hot Sugar Babies), that’s generally how you’d encounter them as well. 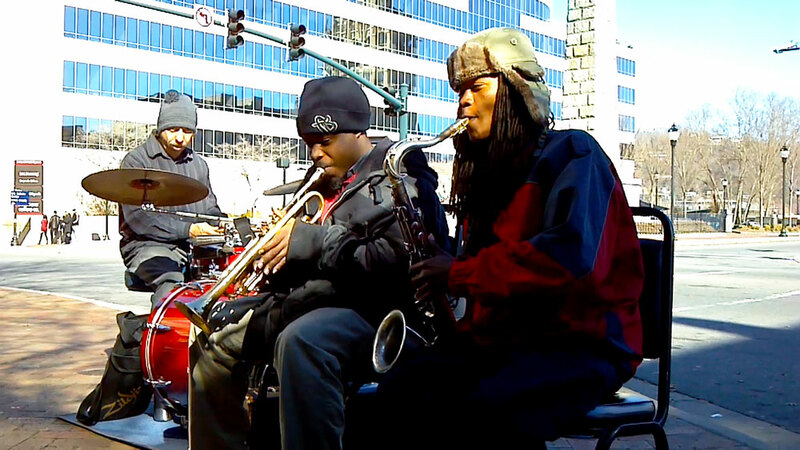 But the lure of playing for tips in the height of Asheville’s tourist season brings even the professionals out for a piece of the busking action. Angel the Balloon Man, with friend. On tour from their home in Phillipsburg, NJ, Jason Deemer and Joe Varga stop to busk near Pack Square in downtown Asheville, NC. 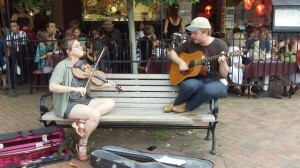 Lyndsay Pruitt on fiddle, Taylor Martin on guitar and vocals.